The Rec Center is closed from March 23 to April 4 to refinish the floors. 2014 was a fine year for Upper Noe Rec Center. We celebrated History Day, produced a wonderful Easter Egg Hunt, held our first full drama production ever on our stage, hosted dance troupes and a huge Zumba party, provided space for community meetings and birthday parties, and kept up a full program of activities and sports for people of all ages. All this while maintaining a clean and functional facility with beautiful gardens. Friends of the Noe Valley Recreation Center (FNVRC) and the Upper Noe Community Recreation Council (CRC) thank everyone for their participation. We extend a special thanks to Upper Noe staff for their courtesy, hospitality, and dedication to our community center. We look forward to 2015 and all that the year has to offer. The next FNVRC / CRC meeting is Wednesday, January 14 at 7 p.m. in the auditorium. Everyone is welcome. Bring your ideas and enthusiasm. Drop by and join in. No registration is necessary. These classes provide all necessary equipment, such as yoga mats, free for your use. What could be easier? Yoga is 9:15-10:15 a.m. Saturday. Zumba is 10:30 -11:30 a.m. Saturday and 5:30 - 6:30 p.m. Thursday. Auditorium Free Play: Tue 1 – 3:30pm; Wed 1 – 2:30pm; Thu none; Fri 1 – 3pm; Sat 12 – 4:30pm*. *Saturday hours can vary, depending upon other activities. Open Gym: Tue 12 – 3pm, 6:30 - 8:30pm; Wed 12 – 2:30pm; Thu 12 – 5pm, 6:15 – 8:30pm; Fri 12 – 6pm. Registration season is now open through February 6. Log onto sfreconline.org and use course bar code 39462. Lottery results will be mailed out in mid-March. The sidewalk gardens along Sanchez Street had been looking rather shoddy. So much so that passers-by and their pets frequently transgressed the small barrier fence set up to separate the garden from the sidewalk, trampling it and the plants within. Neighbors, volunteers and gardening staff pitched in to rectify and beautify the situation. 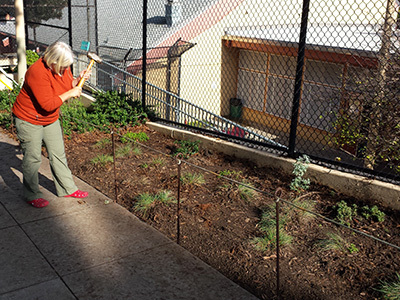 Kate Haug initiated the transformation by donating and installing a number of new plants, a few native sages, lupine, ceanothus, and some poppy seeds. Rec and Park gardeners then did some extraordinary work cleaning up the beds and adding new mulch. Ladybug Gardeners followed up by installing an attractive rope barrier. Neighbors stopped by to plant some bulbs there. Gardeners then returned and put in more plants along the rest of the fence line. What a team effort! 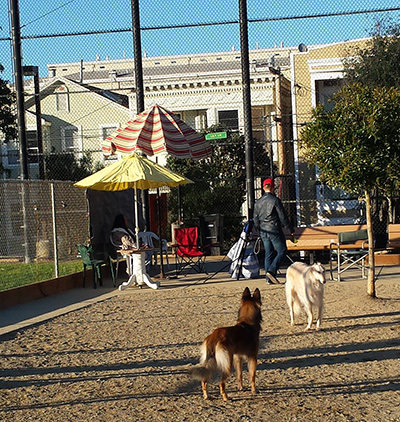 Rec & Park (RPD) hosted a community meeting on December 10 at Upper Noe to discuss the fate of the piece of City property between Billy Goat Hill and Walter Haas Jr. Park. The land, which currently has a rough social trail, falls under the RPD’s Natural Areas program; Manager Lisa Wayne hosted the meeting. Over 30 neighbors attended with heavy representation from folks living nearby who would be closely impacted. Park communities were represented by Robin Lee from Friends of Walter Haas Jr. Park and Chris Faust from Friends of Upper Noe Rec Center. RPD presented four options: 1) No Connection, 2) Trail Connection, 3) Steps Connection, 4) Full Park Development on the site. Option 1 - No Connection - is not consistent to the mission of RPD to connect our open spaces and make them more accessible. Option 4 - full park development on this site is not respectful of the history of this land or the neighborhood relationship to the land. Community members discussed the pros and cons of options 1, 2 and 3. A consensus vote supported some kind of trail connection, which would provide a more natural path between the parks that is safer and easier for hikers, bikers and dogs to use. Some neighbors voiced concerns, including minimizing the impact of a trail on the natural beauty, establishing effective buffers that protect adjacent neighbors from illegal or rowdy behavior, establishing a safe crosswalk across Beacon Street, and maintenance improvement for gardeners and the trash cleanup. Neighbors interested in these concerns may wish to testify when Rec & Park Commission’s Capital Subcommittee reviews this plan. Umbrellas and mushrooms are popping up everywhere in Joby’s Run and in the gardens of the park. Nancy has been leading the installation of these colorful sun and weather shades. Thanks Nancy. The rain has provided the mushrooms. Park staff and volunteers have been removing the possibly poisonous fungi to prevent children and dogs from sampling them. Be on the lookout if your pet is browsing. • Garden at the Park. Help keep the park beautiful by volunteering with the Ladybug Gardeners on the second Saturday of each quarter. The next date in 2014 will be September 13. All ages welcome, no experience necessary, community service hours credited. Even an hour would be a big help! Please email ladybugs (at) noevalleyreccenter.com. Supervisor Wiener: legislation easing restrictions on in-law units. Help keep Upper Noe beautiful. Bring a hat and gloves. Author Diane Donovan: House-moving in San Francisco neighborhoods including Glen Park. Contact info@noevalleyreccenter.com if you have an event that you would like to list. Thanks for your interest and support of your park! Please contact us with any questions or suggestions. Let us know about any community events you are planning at the park so we can promote them. Please forward this newsletter to your friends and neighbors who use the Noe Valley Recreation Center. We want this newsletter to help build the park community -- please help us connect with members of the community.